Back in January this year the total number of available IPv4 address ran out so no more new IPv4 addresses can be issued. You actually have one reserved for you right now as you surf through the internet. With ever increasing number of devices on the internet, the only long-term solution to this problem is adoption of IPv6, which provides over 4 billion times more address allocation space. IPv6 is used extensively in many large networks already. To make it simpler an IPv4 address looks something like 192.67.1.1. While on the other hand an IPv6 address looks like 2001:0db8:85a3:0000:0000:8a2e:0370:7334. This gives a great number of addresses that can be assigned. 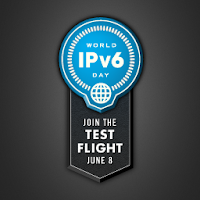 So what is World IPv6 Day and how does it matter to you? World IPv6 Day is an important step in the future of the Internet it's the first global "test flight" of IPv6, the next-generation address format of the Internet. Google, Facebook,YouTube, Yahoo, Bing and over 400 other participating websites will run on the IPv6 addresses for full 24hours i.e from June 8 2011, 00:00 UTC. "In all likelihood, you won’t even notice the test. The vast majority (99.95%) of people will be able to access services without interruption: either they’ll connect over IPv6, or their systems will successfully fall back to IPv4. However, as with any next-generation technology, there may be teething pains. We estimate that .05% of systems may fail to fall back to IPv4, so some people may find Google, Facebook, Yahoo, Bing and other participating websites slow or unresponsive on World IPv6 Day. This is often due to misconfigured or misbehaving home networking equipment, such as home routers, that can make a computer think it has IPv6 connectivity when in fact it’s not working."